TNT N.V. was an international express, mail delivery and logistics services company with headquarters in Hoofddorp, Netherlands. TNT operated the Dutch national postal service under the name TNT Post. The group also offered postal services in eight other European countries, including the UK, Germany, Italy and Belgium. On 2 August 2010, TNT N.V. announced its intention to split up into two independent companies, an express and a mail company. The UK operation changed its name to Whistl. The name has changed due to the split of TNT Group in 2011 and TNT Express keeping the rights to use the TNT brand. The same process has occurred in PostNL’s other international markets with Germany rebranding to Postcon and Italy to Nexive. 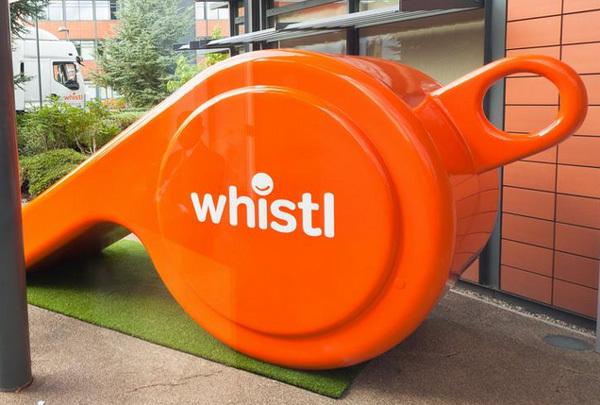 We chose Whistl because happy people Whistle, it has great recall and memorability, and because it’s human. The name is kind of catchy, and I like that the word is still pronounceable properly with the "e" at the end. The logo… it looks kind of cheap. I think it's the combination of the orange color, the giant tittle, and the Helvetica Rounded-esque typeface that make it look almost like a low-fare airline, like EasyJet. When it comes to sending mail, there is something comforting about giving it to a corporation or organization that looks like it means business. I understand the desire to come across as friendly and approachable but this might cross the line into too much chumminess. Thanks to Matthew Kelly for the tip. TNT N.V. was an international express, mail delivery and logistics services company with headquarters in Hoofddorp, Netherlands. TNT operated the Dutch national postal service under the name TNT Post. The group also offered postal services in eight other European countries, including the UK, Germany, Italy and Belgium. On 2 August 2010, TNT N.V. announced its intention to split up into two independent companies, an express and a mail company. The UK operation changed its name to Whistl. The name has changed due to the split of TNT Group in 2011 and TNT Express keeping the rights to use the TNT brand. The same process has occurred in PostNL's other international markets with Germany rebranding to Postcon and Italy to Nexive.